A sloop with a plum bow, strongly believed to be famous PURITAN fresh off her successful America's Cup defense in 1885, races with two schooners off the coast of Brooklyn and Staten Island in New York's Lower Bay. A full rigged merchant sailing ship heads out under tow from a pilot steam tug, and several other sails fill "The Narrows", the watery gap between the headlands on the approach to Upper New York Bay and the seaport of Manhattan. 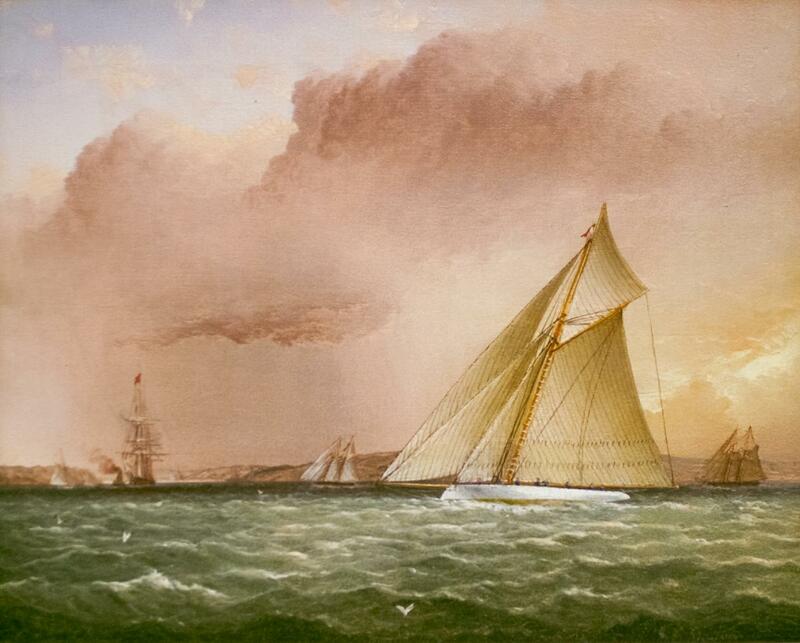 James E. Buttersworth earned his reputation as the premier artist of 19th Century American yachting, and while he painted through the Northeast, this is one of his favored locations. The water of New York Bay is animated with a stiff breeze-driven chop, harmonious to the late afternoon setting sun, while seabirds stay just above the surface. While the light is still strong, the acers are headed to their home berths. PURITAN, owned and raced by John Malcom Forbes, was built in the New York Yard of George Lawley & Son in 1885. She triumphed in the defense of the America's Cup in 1885 against the English challenge of Sir Richard Sutton and his Cutter GENESTA. PURITAN, with her compromise cutter hull / sloop rig, was one of th every first of her style built in America. She'd be the primary influence for MAYFLOWER which would win the Cup Defense the following year. The New York headlands appear just distant enough to show little but their green foliage, and the sky varies to a sunny brilliance toward heavy clouds. The white hulled yacht was one of the very first so styled, after having her hull painted black for her Cup match. Soon, all others would follow suit.